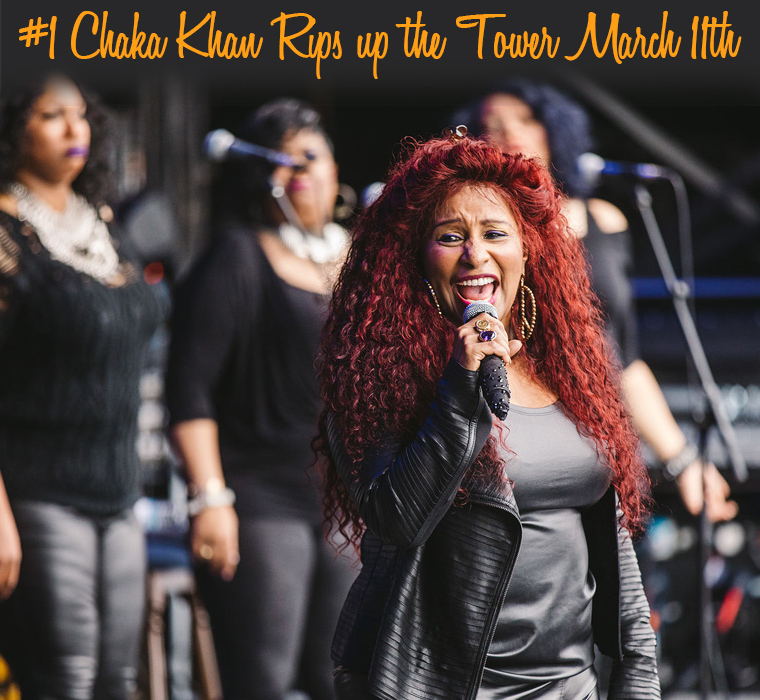 Sunday, March 11th Chaka Khan and her rich, one of a kind voice will "Walk Through the Fire," and bring the house down with one unforgettable song after another -- and "Ain't Nobody" gonna walk away disappointed! Chaka Khan is one of the world’s most gifted and celebrated musicians, with a rich musical legacy, the 10-time GRAMMY® Award-winner is looking forward to a celebration of a lifetime. A songwriter, actor, author, philanthropist, entrepreneur and activist, Chaka Khan has influenced generations of recording artists. She has the rare ability to sing in seven music genres, including R&B, pop, rock, gospel, country, world music and classical. Affectionately known around the world as Chaka, she is revered by millions of fans as well as her peers for her timeless, classic and unmatched signature music style and ability. This pup may not look excited, but under that 'Why me?' exterior lies the heart of an Easter Adventurer. So pack up your own adorable litter and head for these exciting Easter Events all over the County! There’s no place quite like Bunnyland where children can hop aboard a hayride that winds through the woods to the Easter Bunny’s house! Be sure to bring your camera since the Easter Bunny likes to take pictures and give special treats to everyone who visits. 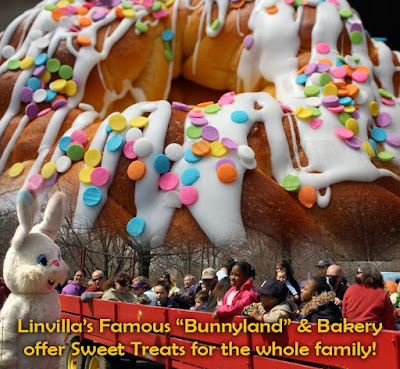 Adults will find plenty of Easter treats to take home at Linvilla's Fresh Market & Bakery. Their Farm Market will be stocked with Easter breads, Easter cakes, and of course Easter candy. Cheese babkas, hot cross buns, cupcakes, cookies and Linvilla’s famous pies will be freshly baked for you to indulge and tastefully celebrate holiday traditions. PLACE YOUR ORDER NOW by calling 610-876-7116. Visit the Garden Center to check out their incubator full of newly laid eggs. This year, you'll see baby quail hatch and take their first steps. Then moo-oooooove over to the Farmer's Market where you'll see adorable baby Calves, as well! 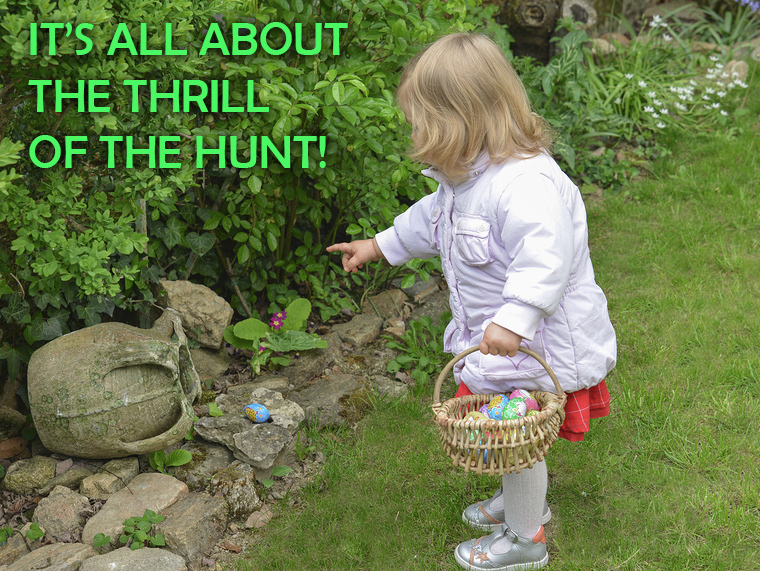 Take your child on an Easter Egg Hunt! Just be prepared to answer the age-old question: Where do Easter Eggs Come From?!?!?!? Before you crack like an egg under the pressure...here's what we found at HistoryRocket.com: It all starts with the Easter bunny. The legend of the Easter Egg may have originated in Germany, where children believed in the appearance of the egg laying hare every Easter and were taught to encourage its visit by building egg-friendly nests. Alternatively, the belief in a rabbit who lays eggs may have begun far earlier, with the Romans who believed that the egg is the origin of all life on earth. The American tradition of the Easter egg hunt began in the 1700s right here in Pennsylvania when the Germans migrated to the New World with their belief about the egg laying rabbit. It soon spread across the country with parents hiding eggs for children to find. Then the traditional hard boiled eggs turned into eggs made out of chocolates and thus, began the practice of hiding Easter eggs. Check out these Easter Egg Hunts all across the County! Search the fields of the farm to find eggs with treats and surprises in them! 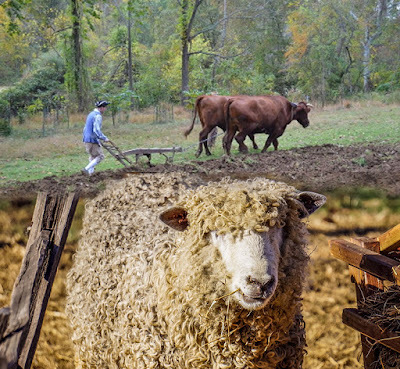 After the hunt there will be a puppet show by the Segal Puppet Theatre Company, and families are invited to stay and explore the farm, meet the animals and learn a little bit about life in the Colonial Era. a 'Colonial' Egg Hunt at the PA Plantation in Ridley Creek State Park. This event can sell out, so purchase tickets online in advance to be guaranteed a spot and to avoid the line of people paying at the door. Admission is $8.00 for adults and children ages 4 to 12. Children under age 4 are free. 11:00 AM to 11:30 AM ---- Glen Providence Park, Media. 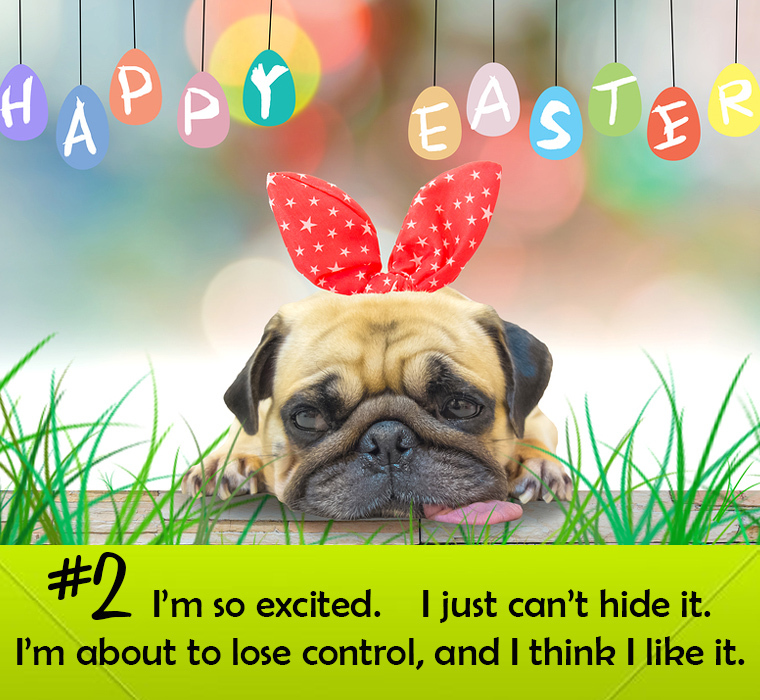 MARCH 24th - Great Media Easter Egg Hunt - Free! 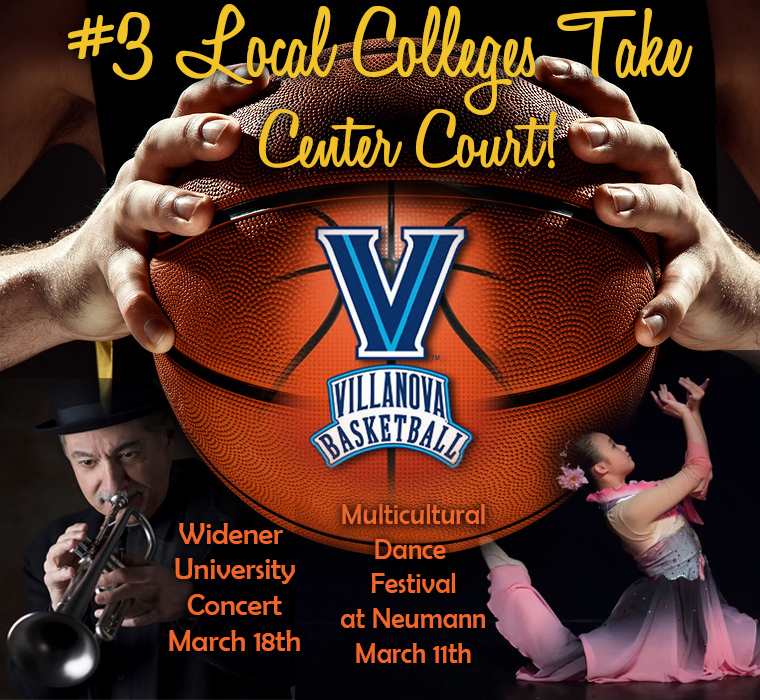 Glen Providence Park, 11:00 a.m. ---- Rain Date March 25, 1:00 p.m.
From Court to Chords to Choreography - Delco Colleges abound with opportunity to enjoy world class sports, great music and multi-cultural dance performances. The Widener University Recital Series, now in its second season, brings world-renowned musicians to both Widener students and the community. John Vanore of Springfield is Artist in Residence at Widener and an accomplished jazz musician. He and his band, Abstract Truth will perform in the Widener Recital Hall. Vanore has sustained successful concurrent careers as a trumpeter-composer and a music producer. 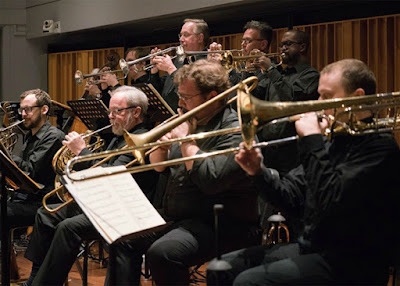 He toured with the Woody Herman Orchestra and played trumpet to accompany such notable entertainers as Tony Bennett, Sammy Davis, Nancy Wilson, Mel Torme, and more. As a producer, he has received a Gold Record for his production of Michael Crawford’s “On Eagles Wings” and has produced recordings for Angel/EMI Records, Windham Hill Atlantic, PBS and Miramax. Reservations are encouraged. Reserve via email to: music@widener.edu and include the concert date in the subject line. For more information contact the Music Department at 610-499-4339.
International Ballet Classique presents its second annual Multicultural Dance Festival at Neumann University. 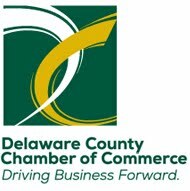 It will showcase the vibrant spirit of the diverse cultural communities throughout Delaware County. 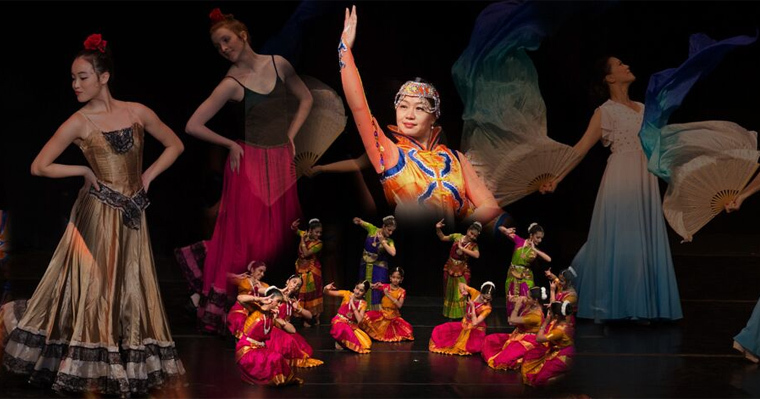 Dance professionals and students from 9 schools and dance companies will share their culture through North and South Indian, Russian, Chinese, Latin, Polynesian, Ukrainian, and Irish dances. Purchase tickets at the International Ballet Classique Website or by phone: (610) 986-2472. 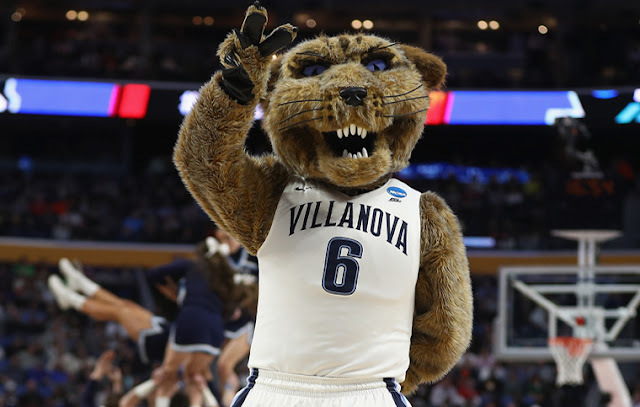 AT VILLANOVA UNIVERSITY -- Their Wildcats Men's Basketball team dives into March with sights firmly set on a third National Championship! Last year Delaware County's WW1 Commemoration Committee launched one of the region's most exciting and wide-spread salutes to the 100th Anniversary of America's entry into WWI -- a county-wide Poppy Garden program that saw residents and businesses planting more than 20,000 packs of Red Poppy Seeds, made famous in the poem about Flander's Fields. This year the Committee asks residents to dedicate their vegetable gardens, large or small, as a “Victory Garden” to honor the 100th anniversary of the END of WWI– uniting the county, in much the same way as Victory Gardens once united the world by supplementing the food supply during WWI. pressure off the world's food supply. 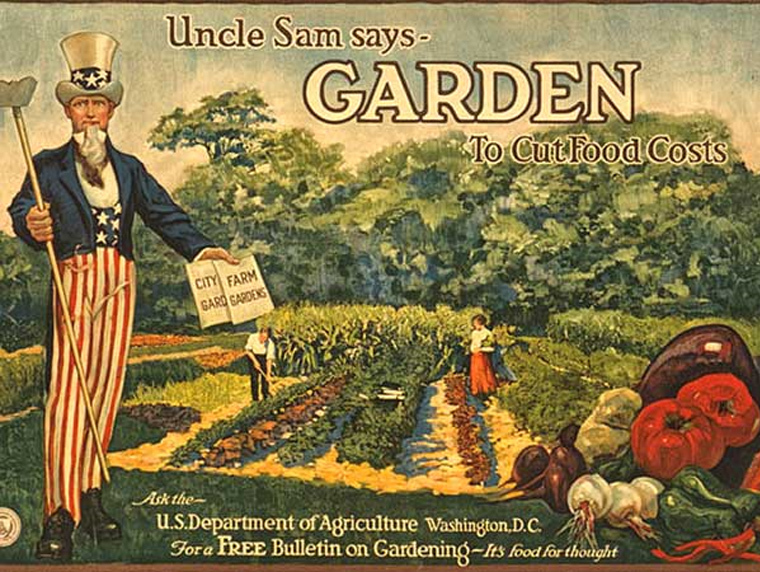 Victory Gardens were used along with Rationing Stamps and Cards to reduce pressure on the public food supply. Turn your backyard garden into a family learning and sharing experience! 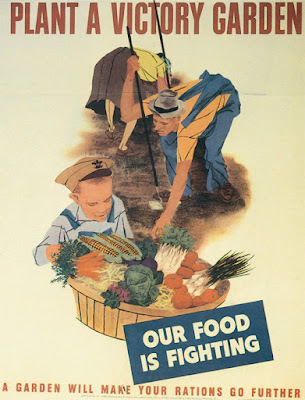 In September the WWI Committee hopes to have a BRING A BOX DAY, when all Victory Garden participants can bring a box or two of vegetables from their garden to a designated spot where they will be collected and distributed to local veterans’ shelters, soup kitchens and Delco Food Banks. 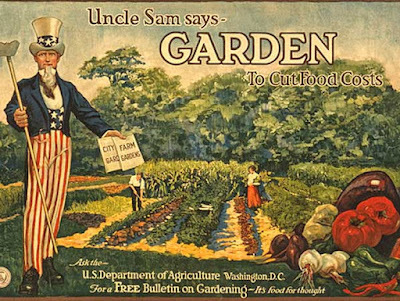 Another Victory Garden print ad. Click here to download the Victory Garden Reference Guide. Beginners and experts will find out how, when, and what types of vegetables to plant. 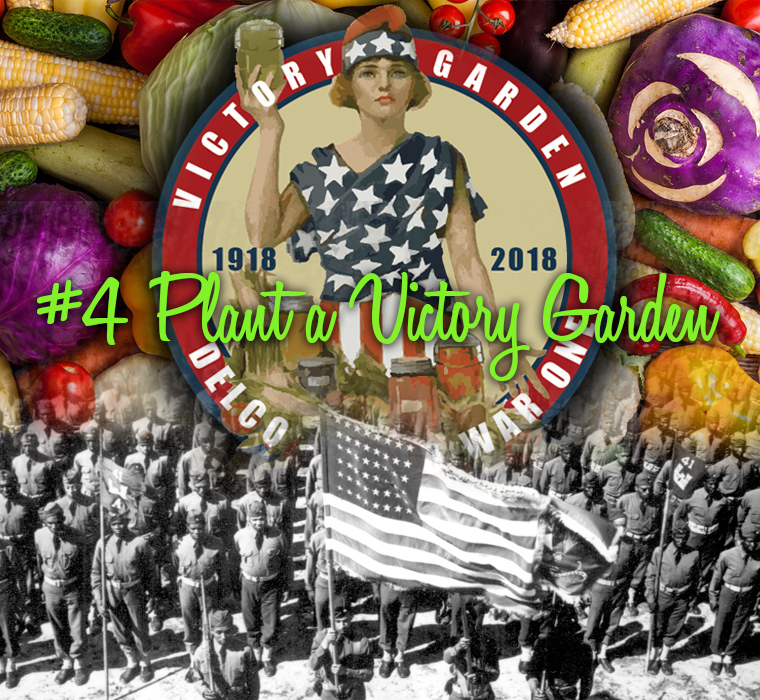 Download a VICTORY GARDEN WINDOW MARKER. In 1918 those who planted Victory Gardens would put this marker in their windows so that people would know this was a war effort garden. Mark the site as a ‘favorite’ because in the coming weeks there will be a major announcement you won't want to miss. Plus new photos, tips, events and other activities will be added each week. And as your garden grows, send us photos that we can share on the website! Three Broadway Stars and Patsy Cline light up the the Media Theatre stage this month with a Benefit Performance, a "Coming Home" Concert, and back by popular demand...Always, Patsy Cline! 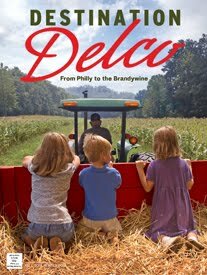 Don't miss this exciting evening fundraiser and celebration of Delco's only professional music theatre. 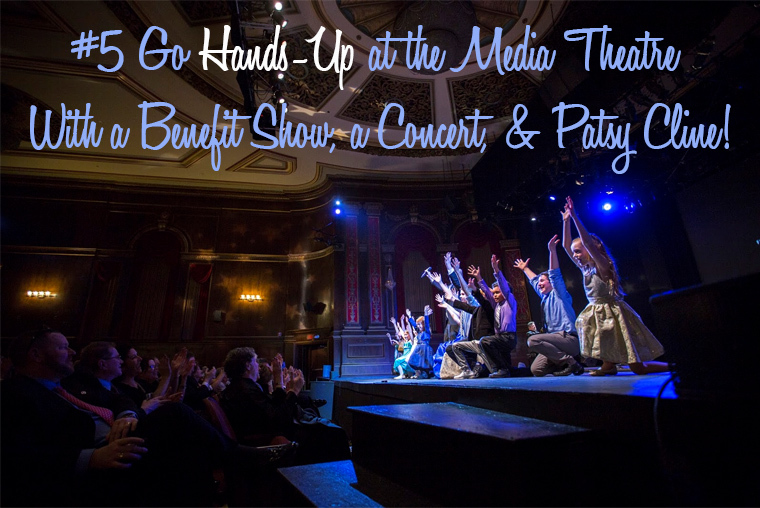 It features a one-night-only concert performance, a reception in the Theatre's Crystal Room, a lively and fun auction, and an award-presentation to one of the Theatre's most cherished supporters. Broadway’s Jenny Lee Stern and Nicholas Saverine will be returning to their Media Theatre roots, where many other stars began illustrious careers. Broadway stars Jenny Lee Stern and Sean Thompson 'come home' to the Media Theatre for a Benefit Gala and Concert. Sean is a Philly native, Temple grad, Media Theatre alum and 2016 Barrymore Award nominee who is currently on tour playing Raoul, the Vicomte de Chagny in Andrew Lloyd Webber’s Broadway bound Phantom follow-up, Love Never Dies. On Broadway, Sean appeared opposite Glenn Close last year in the revival of Webber’s Sunset Boulevard (as the understudy to Joe Gillis). It's back! The hit show with songs made famous by the legendary country singer returns with a two week run starring Broadway’s Jenny Lee Stern. The show features down home country humor, true emotion and even some audience participation in a moving tribute to the legendary country singer who died tragically at age 30 in a plane crash in 1963. The show is based on a true story about Cline’s friendship with a fan from Houston named Louise Seger, who befriended the star in a Texas honky-tonk in l961, and continued a correspondence with Cline until her death. Hear 27 Patsy Cline hits like Crazy, I Fall to Pieces, Sweet Dreams and Walking After Midnight. National Geographic Traveler Magazine called Chanticleer Gardens one of 'North America's Most Beautiful Secret Gardens." 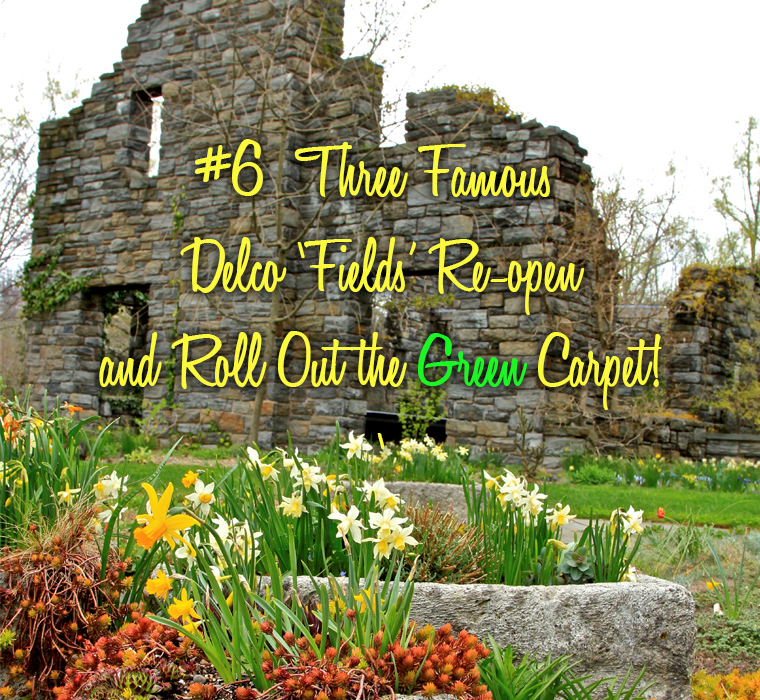 From our Philadelphia Union's Soccer Field to the lush fields of flowers at Chanticleer Gardens, and the newly plowed fields of the Colonial Pennsylvania Plantation - Spring is busting out all over! Two of the Union's three opening season games are at home in Talen Energy Stadium. Located on the Delaware River waterfront it boasts one of the most stunning views in the county. The March schedule is below, but our dedicated Union football fans hope their season goes the way the Eagles football season went: ALL THE WAY! With hopes high for a great season, tickets are selling fast so don't wait - check their schedule and pick the games you want to see! 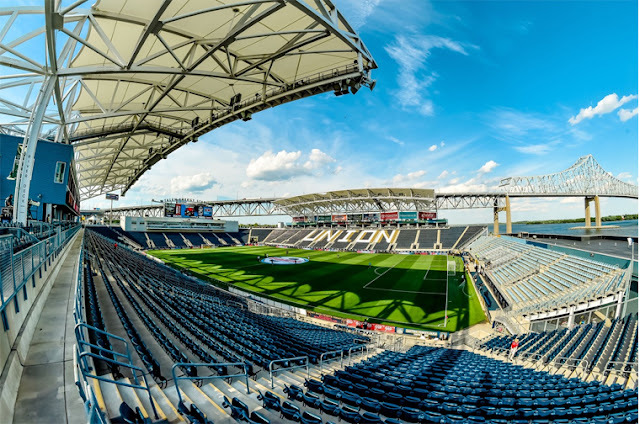 In addition to hosting Major League Soccer, the stadium has also welcomed both Collegiate and International Rugby Championships as well as College Football and NCAA Division I Men's Lacrosse Championships, and Major League and NCAA Divisition I and III Women's Lacrosse Championships. Check the website often to see when these games and other exciting events are happening. This is an awesome place to bring children any season, but especially in the spring when the plowing begins and pigs, ducks and sheep are filled with spring fever - rolling in the mud, diving in the pond and bahhhhhhhing just because they can. Get up close and personal with their "porcine ambassadors" at the pigpen. See the farm's earliest refrigerator...it was called a Spring-house and shows how underground water sources were used to keep food fresh. 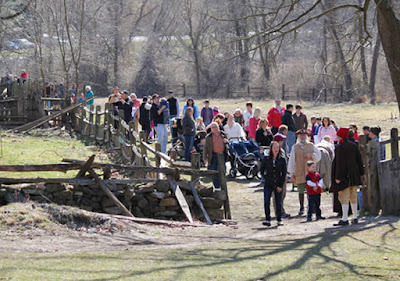 The Blacksmith Forge is a hot spot to visit. Literally! And a local beekeeper maintains hives of honeybees above the orchard - and you can purchase their honey in the gift shop! Check out the website below for fun weekend events starting in April. The garden has evolved greatly since the death of the owner in 1990. Most of the floral and garden development you see today has occurred since 1990, designed by Chanticleer staff and consultants. There are seven Horticulturists, each responsible for the design, planting, and maintenance of an area. The Teacup Garden and Chanticleer Terraces feature seasonal plants and bold-textured tropical and subtropical plants. The Tennis Court, Ruin Garden (pictured at the very top of the story), Gravel Garden, and Pond Garden focus on hardy perennials, both woody and herbaceous. Asian Woods and Bell's Woodland are shady areas. The former features natives of China, Korea, and Japan; the latter, plants of eastern North America. When it can be 70 degrees in February, it's easy to want to kick winter in the #$#! !#!# and send it on its way. 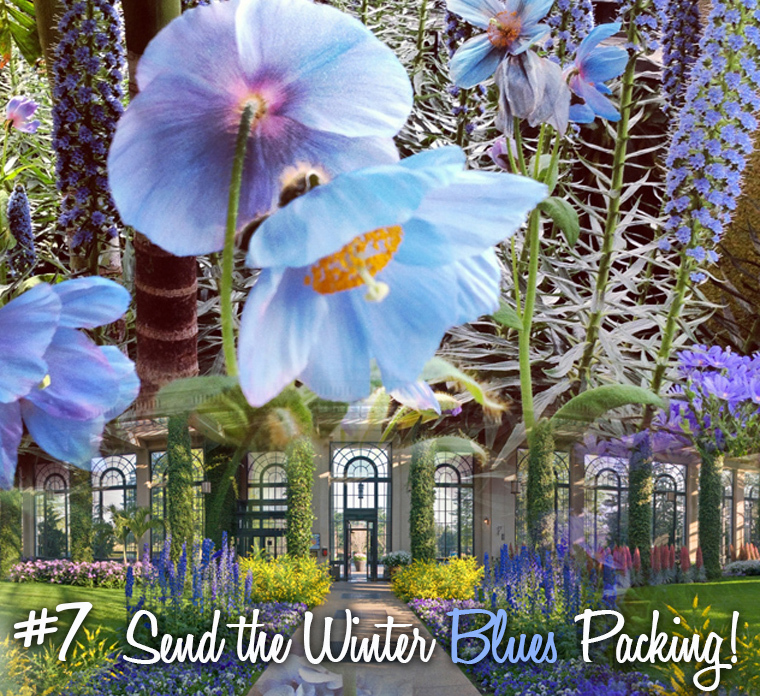 But since we can't change the calendar, let Longwood Gardens show you how gorgeous blue can be! Between March 3rd and 25th, head for this world famous Garden attraction for their first ever Winter Blues Festival, in the Main Conservatory and Exhibition Hall. 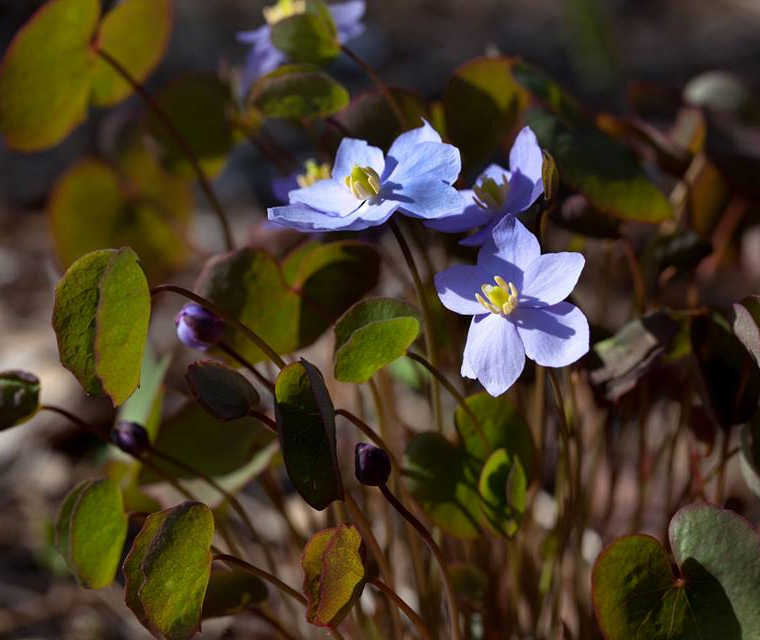 Blue is a rare color in the plant world, but Longwood horticulturists have researched, acquired and grown hundreds of blue-hued blossoms and foliage from poppies to hydrangeas. Universally thought to be the color of peace and tranquility, blue flowers are also said to represent openness, mystery, inspiration, desire and hope. No invitation to the Oscars this month? 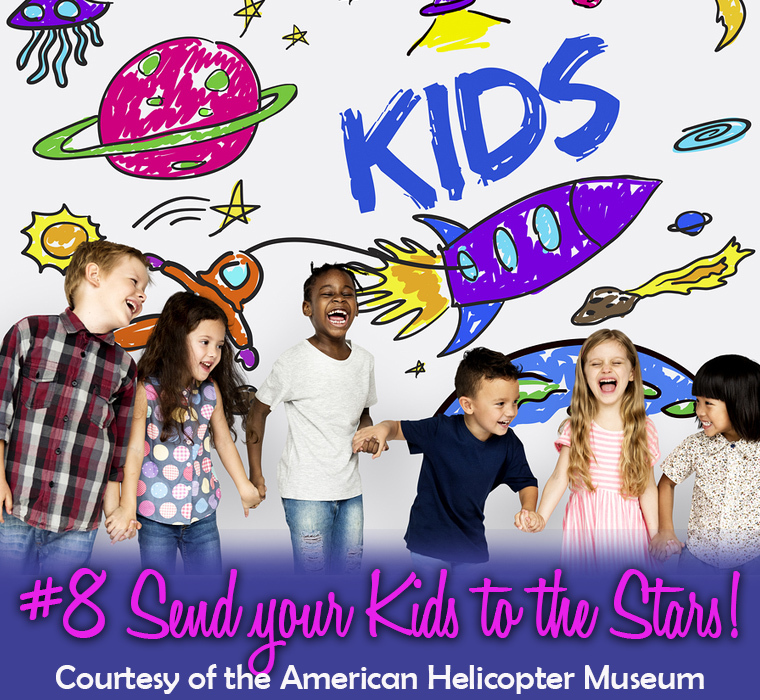 Well, your kids can still see lots of 'stars' at the American Helicopter Museum's first ever Astronomy Workshop on March 31st! Sign up your children, 7 -12 years of age for an unforgettable tour of the stars on Saturday, March 31, from 6 until 9 p.m. It will be a dazzling evening of stargazing and hands-on learning during this three-hour workshop, where their expert staff will teach participants the basics of astronomy from building their own telescopes to actual stargazing (weather permitting). The workshop costs $30 per participant, and includes the price of the telescopes that the students will take home. Pay via PayPal, mail or phone with a credit card. 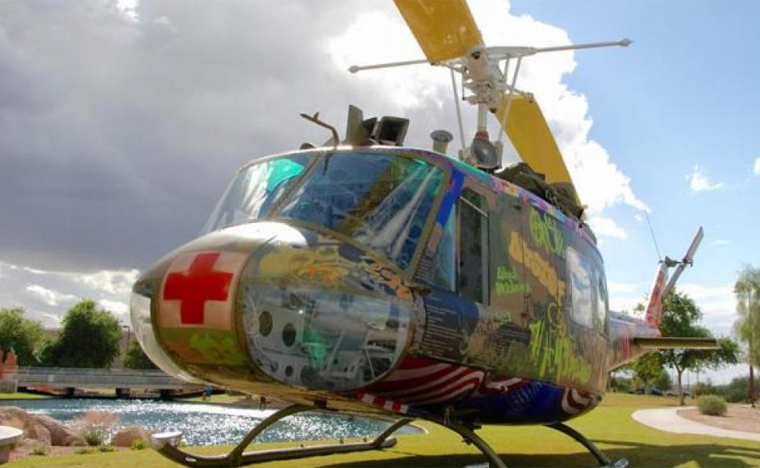 For questions contact Paul Kahan, Education Program Manager, by email at pkahan@americanhelicopter.museum or by phone at (610) 436-9600, ext. 207. Download, complete and return the application. Register Here Space is limited, so register now! The Community Arts Center (CAC) of Media showcases amazing art and artistry of all types, from paintings to ceramics, jewelry, crafts, fashion arts, and even the performing arts! 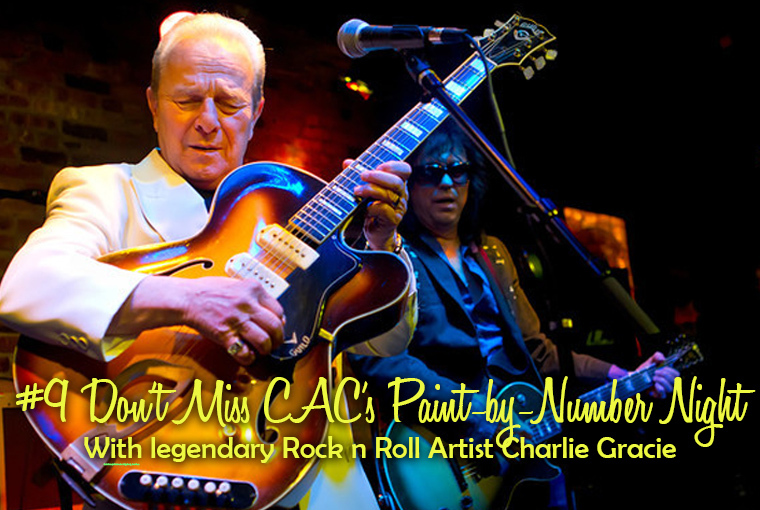 So let's start with some very famous 'numbers' by legendary singer and guitarist, Charlie Gracie - who'll be the March 23rd FRIDAY NIGHT LIVE star performer! 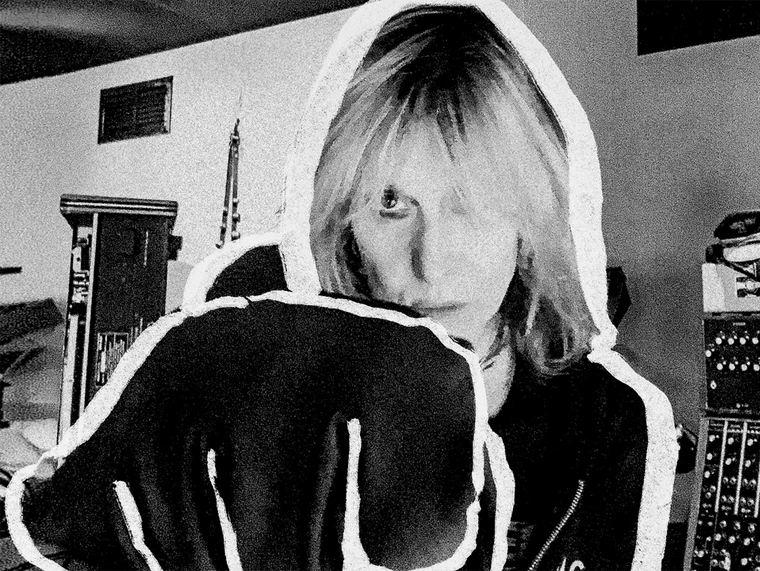 Friday Night Live is a CAC monthly event that brings together live music and live art. Each event features a live music performance from a local artist. During the performance, featured artists create visual art inspired by and responding to the music. The work is auctioned off by a silent auction taking place throughout the evening. The event is set up in cafe-style in the beautiful Duke Gallery. These events are BYOB and BAYF (bring all your friends). 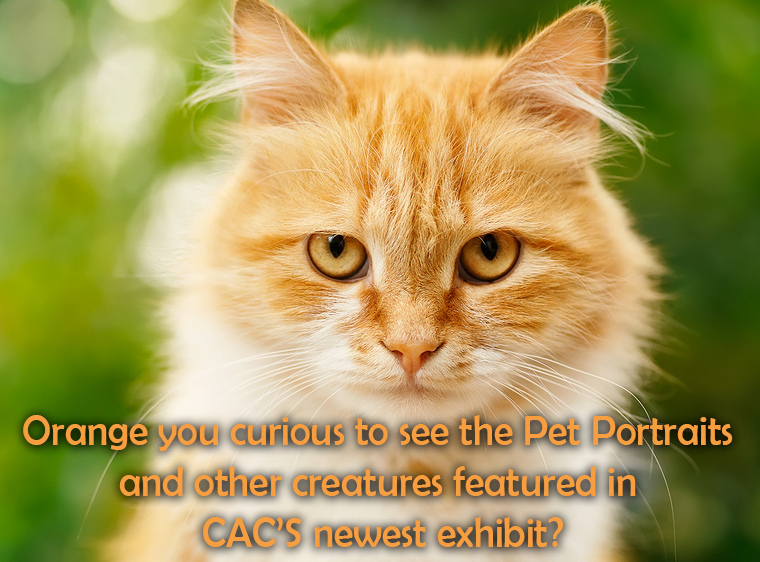 And don't miss their CREATURE FEATURE EXHIBIT that runs through March 10th! Local artists in a variety of media have created animals in everything from ceramics to canvas, including gorgeous pet portraits by Martha Perkins. The exhibit is on the 1st floor of the Arts Center in Duke Gallery. CAC offers countless opportunities to create and enjoy the visual arts. Classes for all ages, exhibits in their spacious new gallery, an active outreach program, an artisans' gift shop, and frequent fine art and craft sales allow people to come together and bring art and creativity into their lives. This slide presentation is based on Arthur Lefkowitz’s latest book. He will present a color slide presentation of 18th Century artistry in the form of studio executed history paintings, portraits, illustrations, maps and rapidly executed field drawings. Dr. Grier is a history professor and Director of the Museum Studies Program at the University of Delaware, specializing in the history of everyday life in America. 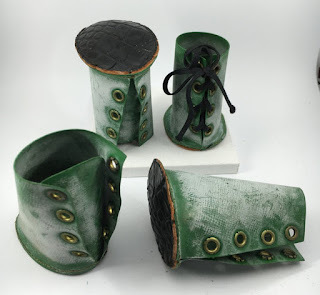 Her presentation reflects a travelling exhibition that has been touring the United States since 2006. 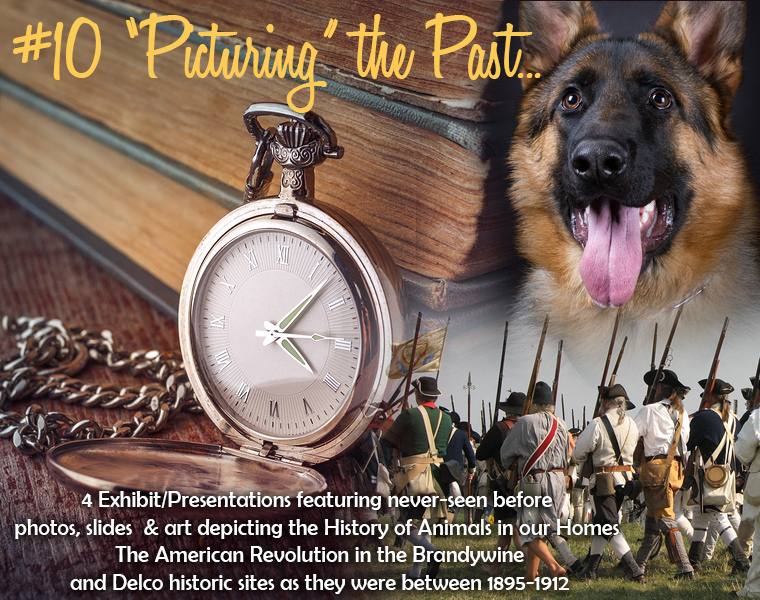 Powell will introduce you to the photography of Charles Philips, an ambitious young draftsman with the Pusey and Jones Company in Wilmington, who photographed working mills, covered bridges, railroads, churches and Friends meetinghouses in southern Chester County and northern Delaware. between 1895 and 1912. Learn about Christy’s Restaurant and Reyburn’s Tavern, viewing rare photos from private collections. 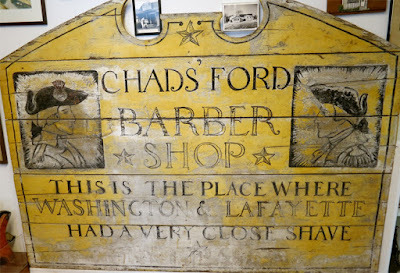 Find out what happened to Quimby’s Gas Station and why there was confusion regarding the Chadds Ford Barbershop sign created by N.C. Wyeth. 1736 Creek Road (Rt. 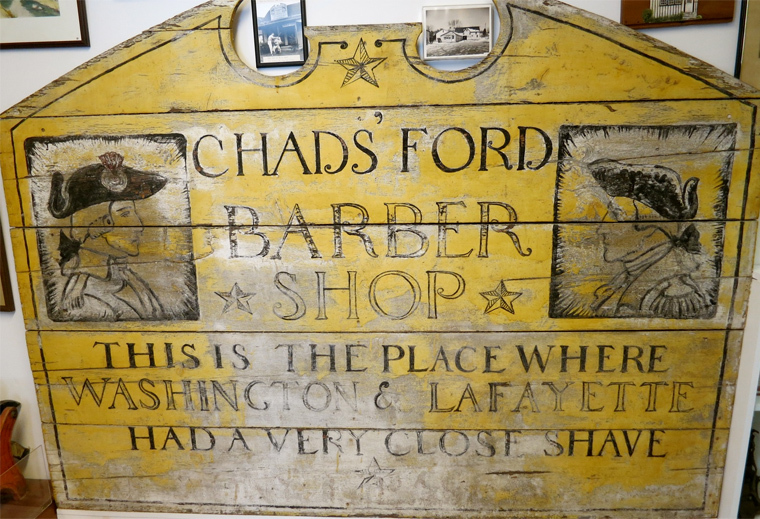 100), Chadds Ford, PA 19317.